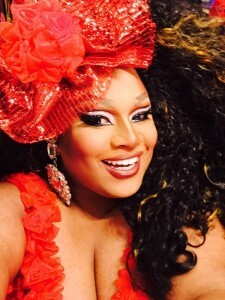 If I had to pick a Miss Congeniality for this season…scratch that…for any season of RuPaul‘s Drag Race, my pick would be Jaidynn Diore Fierce. She can win pageants but with a non-pageant signature Jaidynn style. She is a drag mother-less self starter who taught herself how to make her unique outfits from watching YouTube tutorials! The most endearing quality Miss Fierce possesses, however, is her gentle energy. She doesn’t need to yell to be heard. She kindly suggests and infuses all her words with an extraordinary positive outlook. What’s next for Jaidynn? Is there a “coming out” story? Listen to the downloadable podcast above and read an excerpt from our conversation below to find out! Jaidynn: Heeey! How are you? I’m so good! How are you doing? I am doing excellent, darlin’. Excellent! I am getting my life. Yes! Good. Are you in Nashville currently? No, I’m in L.A. actually. I’m here in the studios. I’m actually in the bathroom! Trying to get some privacy right now. There’s a lot of filming around the corner. So you might hear an echo. Isn’t that exciting? Yes! Are you enjoying your time in sunny California? I am. It is so beautiful. I love the palm trees. It is absolutely incredible. I know that you’ve been traveling all over the place. Is there any city other than Nashville that you’d consider moving to? Nashville is home for me and the reason why is I really love Nashville. It’s not too big, it’s not too small. I already know where everything is, because I’m horrible with directions and the cost of living is very cheap compared to a lot of other states. I love Nashville! I was so sad to see you go from RuPaul’s Drag Race. I think you are the frontrunner for Miss Congeniality because you are so sweet, endearing and honest. I love the moment when you were feeling that Violet Chachki wasn’t speaking to Lucian Piane in the best possible way and in the kindest, non-shady way you let her know that it was a concern of yours. That’s the way that I like to approach things. I have a lot of patience and it takes a long, long time before I actually get to a point of anger or blowing up. I’ve always been a relatively calm person and there’s a way to talk to someone so that they receive it a lot better. I feel like if I had yelled at her or gotten an attitude or done all that lipsmackin’ she wouldn’t have received that. She wouldn’t have been able to open up and actually think. It’s been five years this June. I remember starting out on the amateur cast at Play. Ooooh honey, I was a hot mess with a sheet of fabric literally wrapped around me. That’s what I would do when I started out. I would go to Walmart in the fabric section. I would get a yard of fabric, safety pin it over my body and put a belt around it. Ooh girl, I thought I was Beyonce and nobody couldn’t tell me nothin’! You’ve come a long way since then. Where did you get your name from? Ever since I was a kid, I’ve always loved the name Jaidynn. I’ve always been obsessed with that name and I thought when I turned 18 that I would change it. But then when I actually got to 18 I din’t change it. 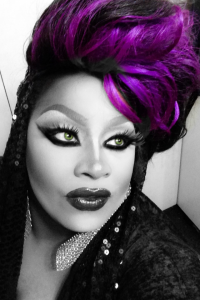 Then when I discovered drag I thought, that’s it! Diore is a play on words on fashion because I’m a big girl but I want to be known as a fashionable big girl. I like fashion that is different and Fierce is because I am what? Fierce! I heard you talking on Whatcha Packin’ with Michelle Visage about how you developed a bond with Max. Why do you think she’s the one you most bonded with? I noticed on other seasons that there were cliques that formed. I’m not the type of person that really gets into a clique. When I first came onto the show I was open to everybody but as far as Max goes, as time went on….for her to be supportive when I needed it most meant a lot to me. When you get to know Max, she’s very laid back and very calm and I think that we are very similar. I’m also so attracted to people who are different and there’s something about Max that is so different. Her drag in intriguing. I wanted to know more about her and she drew me in. People died over your Bianca Del Rio impression. Have you heard from Bianca about it? Yes. She gave me a shout out on her page! She said she loved it and she posted a picture that showed Latrice Royale and Bianca in a bed and that it equals me. It was a picture of me dressed as Bianca. I thought it was the funniest thing. She’s amazing. I got my life with that. I wanted to ask about the episode where you had mentioned that you hadn’t come out to your family. Obviously that has now aired. Is there any difference going on there now? Definately. I’ll definately tell the full story. I’m gonna sit down in front of a camera and have my coming out story. I do know that my mom did watch the episode and she did call me. When I get done with all this touring we are going to sit down and talk. I already feel better about my situation. It feels like this big cloud that is starting to move away. Jaidynn went on to discuss her brothers’ reactions to the episode as well. To find out more details of Jaidynn’s coming out story as well as how she’d hashtag some of her season 7 sisters, download and listen to the full podcast above. #GetYoLife!